On April 2, 2008, The United Kingdom decided to change its currency. Not to the Euro ... heavens no! But the august pound sterling – the third-most-common, and forth-most-traded currency in the world – is getting a long overdue face lift. And the new coinage is a graphic dream: an integrated series of seven coins that work individually, as a collective whole, and reinforce the kingdom's royal brand. Naturally, it was designed by a young graphic artist with no experience in currency design. The UK's Royal Mint launched an open competition to find designs for six of the UK's eight circulating coins in August 2005 (Initially , the £1 coin and £2 coins were not included in the design brief but the £1 was later added to complete the winning set of designs). The competition generated more than 4,000 designs from over 500 people – members of the public, specially invited British artists, artists from other European countries, and members of the Royal Mint Engraving Department. The Royal Mint launched the contest in an effort to renew and reinvigorate the United Kingdom's coinage almost 40 years after the introduction of the current decimal-based currency system. The Royal Mint's creative brief allowed those taking part a free hand to prepare "a coherent series of designs," encouraging heraldic emblems and motifs but leaving the door open for other ways in which to [symbolize] the United Kingdom and its member states. The judging process was distinctively British. All of the 4,000 submitted designs were inspected by the Royal Mint Advisory Committee. The committee's preferred design was then recommended to the Chancellor of the Exchequer, in his capacity as Master of the Mint. Finally, his recommendation was passed on to Buckingham Palace and the winning design was approved by Her Majesty The Queen. Surprisingly, the winner was not a specially invited artists or a member of the Royal Mint Engraving Department. The winner was Matthew Dent, 26, originally from Bangor in North Wales, now living and working in London as a graphic designer. Matthew saw the competition advertised in one of the national newspapers and he threw himself wholeheartedly into the project. In seeking to spread a single design across six denominations, Matthew conceived an imaginative and clever solution new to British coinage. Individually the coins focus on details of the Shield of the Royal Arms but when placed together they reveal the complete shield. The result is a set of coins firmly rooted in the heraldic traditions of the British coinage yet beautifully contemporary. Of his design, Matthew says, "The brief called for six designs to represent the United Kingdom. 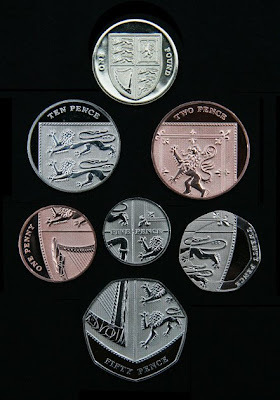 The idea of a united design in a jigsaw-style execution – choosing one subject to appear across the six coins – avoided any awkward emphasis on any particular countries and was a solution which I could see working. This approach seemed intriguing since I hadn't seen anything like this used in coin design before. "The issue with this for me lay in their distribution; how to represent the whole of the United Kingdom over six coins. The idea of a landscape appealed to me; perhaps using well-known landscapes from different areas around the United Kingdom which could stretch off the edge of one coin onto another. This seemed like a good solution but I also wanted to look at other options and themes. "The reason I settled on heraldry as a subject matter for this idea was ... the shield of the Royal Arms was a successful vehicle for the design in terms of its almost square-like mass. In practical terms, this meant that coins could be arranged above and below one another as well as to the left and right of one another – a much more satisfying result than had it been a linear arrangement." It is not surprising then that Matthew chose the Royal Arms, or that the Royal Mint encouraged designers to do so. Virtually unchanged since the reign of Queen Victoria, the Royal Arms is a symbol of the Queen's authority over the whole of the United Kingdom, and has been used to powerful effect by numismatic artists over the course of her reign. The Royal Arms is divided into four parts: England being represented by the three lions passant guardant in the first and fourth quarters, the Scottish lion rampant in the second and the harp of Ireland in the third, with all four quarters spread over the six coins from the 1p to the 50p. Completing the new range of coins is the £1 coin featuring the shield of the Royal Arms in its entirety, uniting the six fragmented elements into one design. "My initial excitement over this jigsaw style approach was that I could imagine the coins being played with, arranged and enjoyed in a way in which coinage hasn't been before. I could see their appeal to children, their interest to adults, and also I could imagine that I'd want to piece them together myself given half a chance. This 'interactive' aspect of the jigsaw idea is an exciting angle. Assimilating a design is a satisfying and empowering activity; choosing to create the design as intended or doing something completely different – it's up to you. Yes it's coinage, it's a practical medium, you can still buy your pint with it, but this approach gave coinage some scope to develop a different personality."